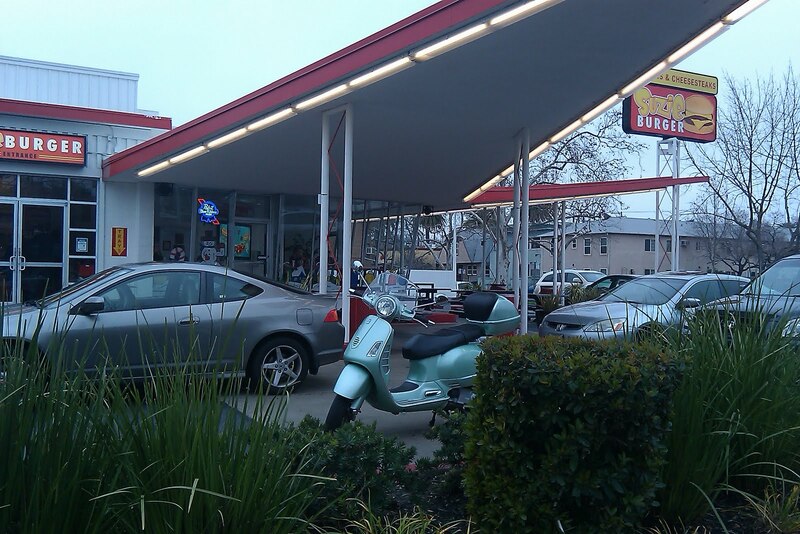 I started this blog thinking of scooters and the Great American Hamburger Stand. Here in Sacramento the first places that came to mind were Scott’s Burger Shack, Ford’s Real Hamburgers, Cookie’s Drive In, and Whitey’s Jolly Kone. It only took two months for me to stray from this approach and begin visiting restaurants that many hamburger aficionados would not want to venture. The white tablecloth stop Ella Dining Room was about as far from my original plan as possible. Do not get me wrong, I do not regret these diversions, I only think I should visit hamburger stands more frequently. That is what brought me to Suzie Burger on 29th and P Streets in Sacramento. Well, I had an errand to run and the hamburger joint was only a few blocks off the path. The only word I have heard about Suzie’s was from my cheapskate friend Lenny. He said with penny-pinching glee that a hamburger, fries, and a soda came to under nine bucks. Now I have been to some of the places Lenny has suggested, and I always come away with the cliché “you get what you pay for.” I think whenever Lenny bites into a cheap burger he thinks, “Mmmm, that dollar saved sure is juicy!” I could never talk Lenny into trying Ella’s Grilled Hamburger of Wagyu Beef —the sodas alone cost nearly as much as he would be willing to shell out for a burger. When I visited Suzie’s the customer service was similar to the famous SoCal-based fast food chain, but the culture was urban. I walked into where the office would have been during the building’s gas station days. If I was around in the 50s and needed a tune up on my ’57 Bell Air, I could imagine a person named Ernie would have helped me. Ernie would have come back from serving his country and got his old job back at the station working on cars. The office is different now and so are the personnel. The person taking my order is a young platinum blond woman. Blondie has tattoos, as I would imagine Ernie would. In addition, Blondie would trip metal detectors at the county courthouse and airport as would Ernie. Ernie from the shrapnel he received from a German potato masher while liberating a French village in ’44 and Blondie from the metal piercings in her face. When Blondie gave me her In-N-Out Burger smile her face shined—literally. I ordered the Double Deluxe Cheeseburger with raw onions, French fries, and an iced tea. I will not go into any detail on how awful the iced tea is. That is what I get for walking away from carbonated drinks. Most hamburger stands do not put much effort in making a good iced tea. I sat down in the garage where Ernie rotated tires, worked on transmissions, and carburetors on cars exclusively manufactured in the Detroit area. The bays are gone, black metal benches bolted to the cement are in their place. With such a large area surrounded by metal walls and metal furnishings, the room is noisy. Today there are many families enjoying lunch. It says on the menu that Suzie’s hamburger patties are “3.2 oz. patties of fresh 100% USDA Choice Beef” which is relatively small for today’s standards. I am glad I ordered a double. The menu claims these patties are fresh, not frozen. I will take Suzie at her word though I have had better hamburger patties made from frozen state. There is nothing wrong with the meat, but there is nothing extraordinary either. 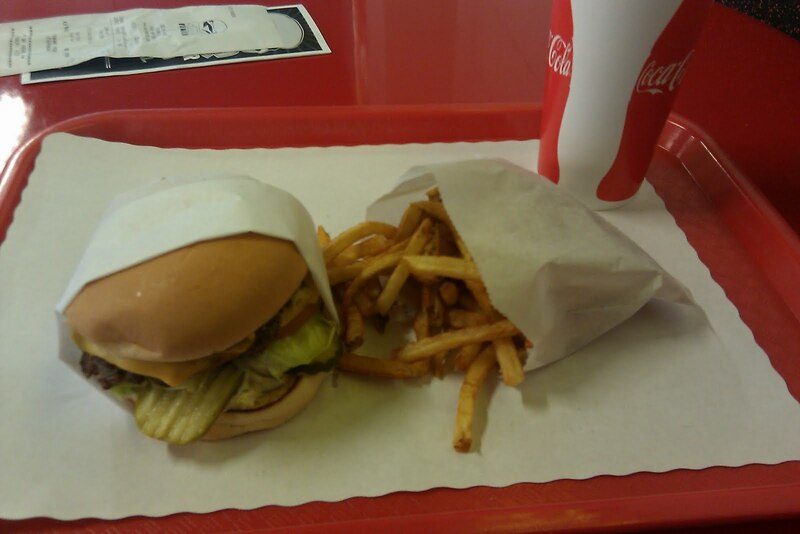 The burger has the usual stuff: lettuce, tomato, pickles, and a special sauce on an unremarkable bun. Suzie offers unlimited free toppings: grilled mushrooms, jalapeno peppers, grilled or raw onions. I could have ordered all of these. Even with two patties, raw onions, and the rest of the fixings, the burger did not seem all that “deluxe.” The hand-cut fries were limp. What a terrible thing to do to spuds! The idea of turning an old gas station into a burger restaurant is quite ingenious and unique items on the menu like a Philly cheese steak, foot-long hotdog, the promising “Suzie’s Big Daddy ½ Pound Onion Rings,” and soft-serve ice cream make this place worthy of a return visit. I just do not think I would order a burger next time.